Grave / Reference: SP. Mem. B. 5. Relatives: Son of Henry Joseph and Sarah Gowers; husband of Phyllis Mary Gowers. Address: 27, Angel St., Hadleigh, Suffolk. Private Bertie Gowers was entitled to two medals; the British Victory Medal and the British War Medal. The two medals above are Berties' original medals, however they were separated for many years and only re-united with the family in 2015 thanks to this project. 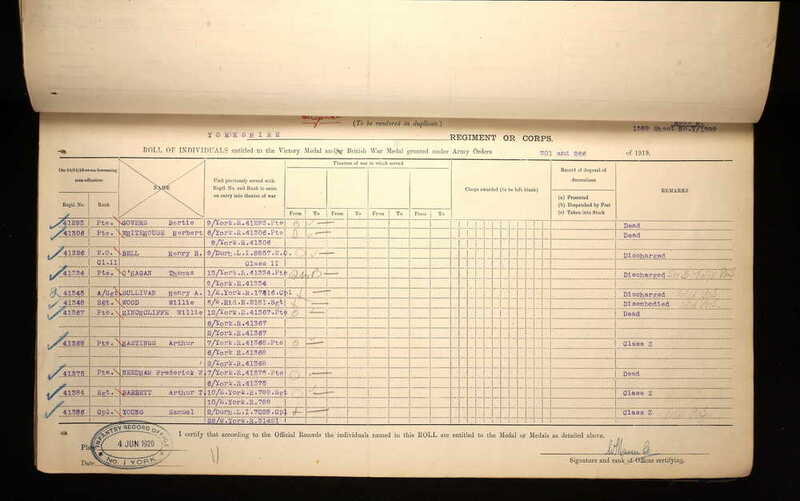 The 1911 Census says that Bertie Gowers was living at home in Writtle, Essex with his father and brother and was listed as an agricultural labourer. In 1915 he married Phyllis Mary Buckledee of Hadleigh, Suffolk. Bertie and Phyllis went on to have two children, Carl born in January 1917 and Ruby born in January 1918. Bertie had enlisted as a private soldier in the Essex Regiment in Chelmsford and was given the service number of 26292. We are not sure if this was a territorial unit but what we do know is that he later transfers to the 9th (Service) Battalion of the Yorkshire Regiment. This regiment was formed as part of Kitchener's New Third Army (K3), raised specifically to support the war effort. 9th Yorkshire Regiment landed in Boulogne on 26 August 1915, although we do not think Bertie was with the regiment at this time since he was never awarded the 1915 Star. The 9th Yorkshire were part of the 69 Brigade of the 23rd Division. We know that Bertie was with the 9th Yorkshire Regiment when they prepared for the 1917 Messines Ridge Offensive. The Battle for the Messines Ridge opened at 3:10am on 7 June 1917 with 19 mines exploding in 19 seconds. The ripple of the mines exploding consecutively gave the effect of a tremendous earth quake. The mines had been strategically placed under German strong points on the high ground. After months of tunnelling and preparing the explosives, the huge explosions that could be heard as far away as London, were the signal for the massed infantry to assault the ridge. Supported by artillery, the initial assault was a success and the British secured their objectives. Over the coming weeks they consolidated their positions. During the initial assault, the 9th Yorkshire Regiment fought for Battle Wood a position just South of Hill 60 and one of the German strong points. The assault started well but as they closed with the German positions the Yorks were engaged by hidden snipers and machine gun fire and suffer many casualties (1 Officer and 67 Other ranks Killed, 10 Officers and 178 Other ranks wounded and 9 men missing). the following weeks they continued operations in this sector and lost several more men, killed and wounded during what was routine day to day life in the trenches. By July, Bertie's Company (D Coy) was sent to relieve the Northumberland Fusiliers in Hedge Street Tunnels. Hedge Street Tunnels were in the Mount Sorrel area, another high feature on the Messines Ridge and were part of a front line trench complex that had tunnels dug into the high ground to provide sheltered accommodation. They had previously been held by the Germans and so the Germans knew all about them and made sure they shelled them as often as they could. When Bertie died, he left behind a 6 month old son and a pregnant wife who gave birth to Bertie's daughter 5 months later. As with all these stories, while we remember the soldiers, we often forget about those left behind and in this case a grieving widow and two children who would never know their father. Carl and his sister, Ruby grew up, married and had children of their own. On 17 July 1917, four soldiers from the 9th Yorkshire Regiment were killed in action at Hedge Street Tunnels and Bertie was one of them. About 700m to the rear (East) of Hedge Street Tunnels was a cemetery that was used by the British from April 1915 and Bertie was at some point buried here. The cemetery is called Larch Wood (Railway Cuttings) Cemetery and after the armistice, the cemetery was extended with burials being brought in from several nearby battlefield cemeteries. In 2009, the surviving family members; Peter Gowers, his wife and his sister Anne, along with his cousin Graham Skinner and his family, made a pilgrimage to Belgium. With the help of a local guide, they traced Bertie's last steps and visited Battle Wood where he fought and Hedge Street Tunnels where he died. They also visited his final resting place at the beautiful Larch Wood Cemetery, were they laid a wreath. The family also took the opportunity to bury some of Carl's and Ruby's ashes by the side of Bertie's headstone. This was a very special and poignant moment for the family; not only did the grandchildren not know their grandfather, but their parents did not know their father either. When the Hadleigh Great War Centenary Project was launched in August 2014, Peter Gower's approached the project with Bertie's story. He told us that he had a photo of Bertie and he had his British War Medal. Peter was not aware that Bertie had also been issued with the Victory Medal. Around the same time, a local collector, David Gant also approached the project. 15 years earlier, he had bought a number of medals from a collectors fair in Kent. He bought the medals because of their connection with Hadleigh. 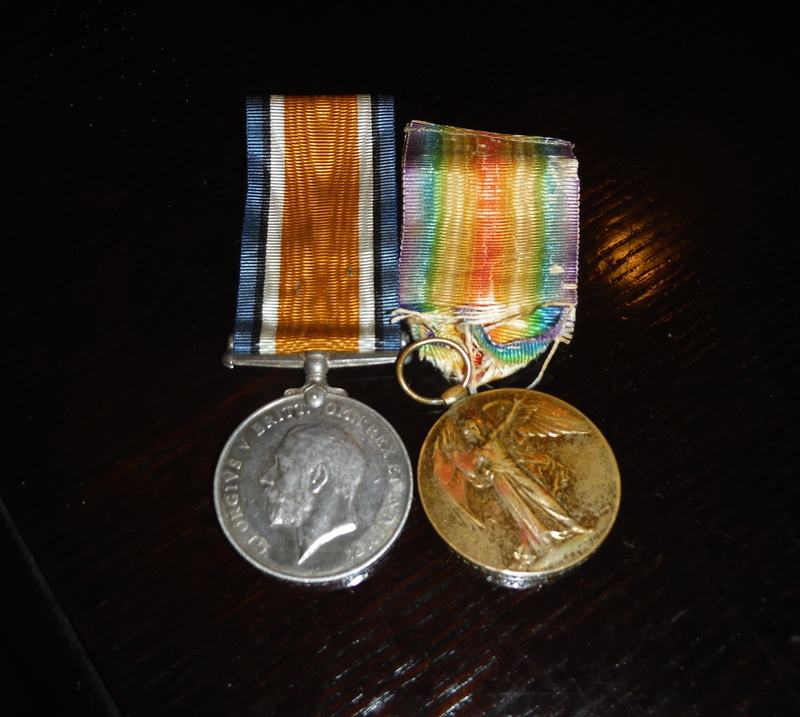 One of the medals was Bertie Gower's missing Victory Medal. When David heard about the Gower's family, he very kindly agreed to give the medal back to the family. The Gower's family are now delighted to be in possession of both medals and thank David for his generous and kind gesture. The story was covered by local press. In 2017, the Gowers family made an emotional pilgrimage to Bertie's final resting place to mark the centenary of his death. During the visit the family walked in the footsteps of Bertie and saw the fields where Bertie once fought. They also took to opportunity to take part in the daily act of remembrance at the Menin Gate. The Last Post Ceremony has taken place every night at the Menin Gate since 1928, when the memorial was opened. The ceremony is organised by the 'Last Post Association' and the local fire brigade play the last post on the bugle. Wreaths are laid in honour of the fallen and the act of remembrance is observed. Peter Gowers, Anne Jakemann and Graham Skinner, Bertie's surviving grandchildren laid a wreath in honour of Bertie. Remembering Bertie Gowers exactly 100 years on. Bertie's grandchildren at the Menin Gate. This is part of a project by the local ringers to honour all the men and one woman from Writtle who fell in the Great War with a special peal of bells marking the centenary of their deaths. The Gowers family and the Writtle bell ringers. We hope that this page has been able to tell the story of Bertie Gowers. If you know of any information which might help to add to the story then please get in touch.